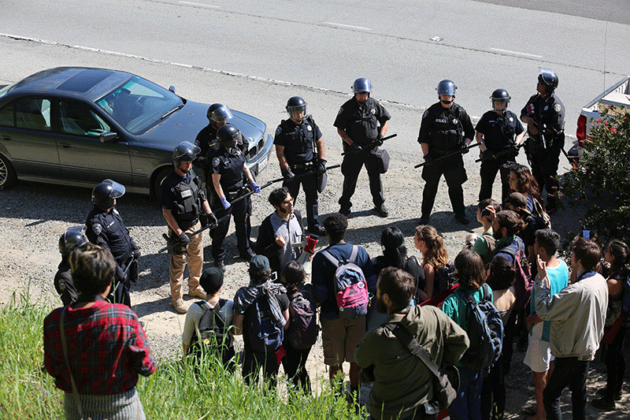 Protesters chanted “Give them water” while standing on the right side of southbound Highway 17. Photo by Camille Carrillo. 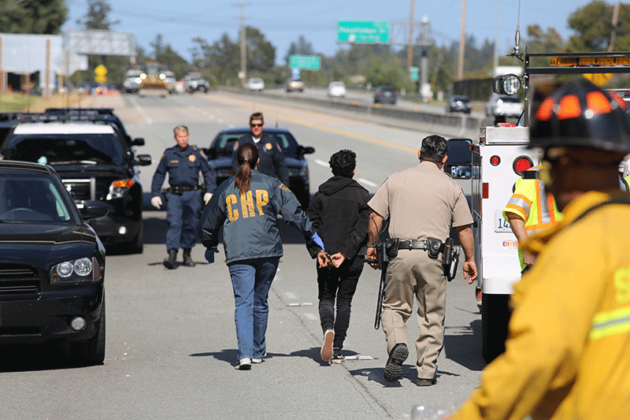 The six UCSC students arrested on Highway 17 are suspended from the university until fall 2016. Photo by Stephen De Ropp. The officers also used a pry bar and hammer to peel back the sides of the garbage bins. Photo by Stephen De Ropp. 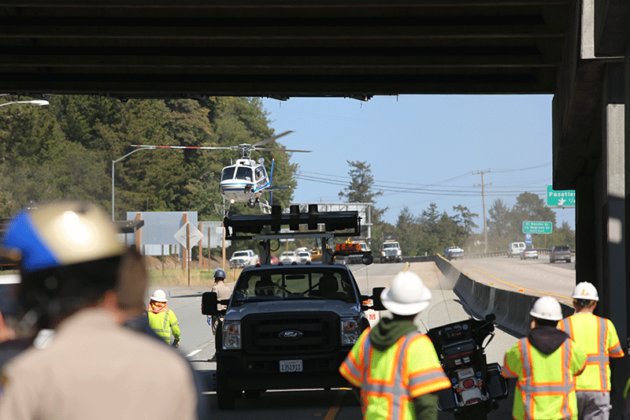 California Highway Patrol helicopters arrived in case of emergency evacuations and to bring more officers and equipment. Photo by Stephen De Ropp. 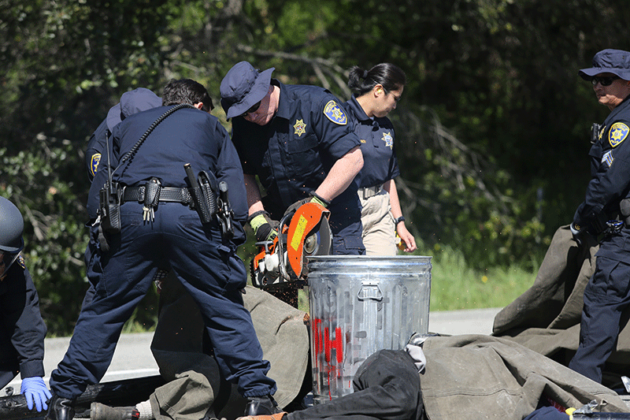 Students were covered by tarps while officers jackhammered the cement and sawed the tubes. Photo by Stephen De Ropp. UCPD used a saw to cut the tubes and garbage bins. Photo by Stephen De Ropp. The police told the students they were trespassing and were subject to arrest if they stayed. Photo by Stephen De Ropp. 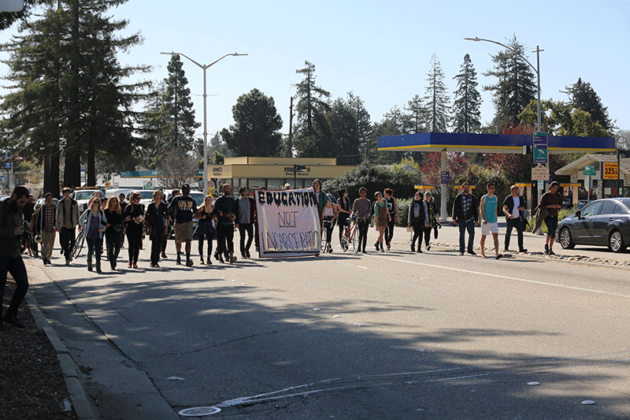 Students marched down Water Street to the Santa Cruz County Jail. Photo by Stephen De Ropp. Six UC Santa Cruz students were arrested on one felony charge — conspiracy to execute a crime — and three misdemeanors — creating a public nuisance, failure to obey lawful order and failure to obey executive order from a police officer — for blocking traffic on Highway 17 on Tuesday starting around 9:20 a.m. Upon arriving at the Santa Cruz County Jail, all six students received a letter informing them of their two-week suspension from UCSC. As of Wednesday afternoon, four of the students remain in jail. Student organizer Barucha Peller said organizers and the students who were arrested have been talking to numerous lawyers about the legality of the university’s interim suspension. The UCSC Campus Code of Student Conduct states, “Conviction of any federal, state, or local law or ordinance may also subject a student to campus discipline,” but Peller said an interim suspension, as the letter stated, is not justified to be two weeks long. She said the letter, signed by Student Conduct Officer Clifford Golz, said the arrested students pose a health and safety risk to other students. Golz could not be reached for comment. The six students were dropped off in the morning and assembled sitting in a line with garbage cans in between them. The cans, called “lock boxes,” were filled with cement and connected through holes in the bottom that had steel pipes fed through. The students were locked in with their arms in the tubes with chains and a carabiner. Each can weighed about 700 pounds. 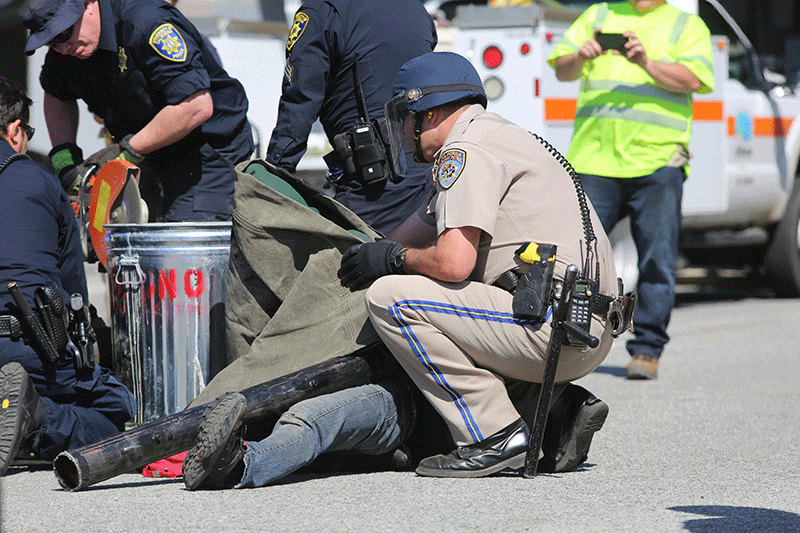 “If a barrel is knocked over, their arms could fall off,” a student protester said. The cement inside the garbage cans had mesh and rebar, which is reinforcing steel. Police say this shows the extent to which the protest was planned, and justifies the conspiracy charge. “These students are obviously going to be arrested, and they put their bodies at risk because the whole student body is at risk and it’s worth it for them to put their bodies on the line,” Peller said before the police began attempts to break apart the lock boxes and arrest the students. About 30 students marched from the base of campus to Ocean Street and proceeded to block the entrance to the highway chanting, “Money for books and education, not for cops and incarceration” through a megaphone, to show solidarity with the six students. A few demonstrators decided to walk to the six students but were stopped by police who told them they were trespassing and were subject to arrest if they stayed. 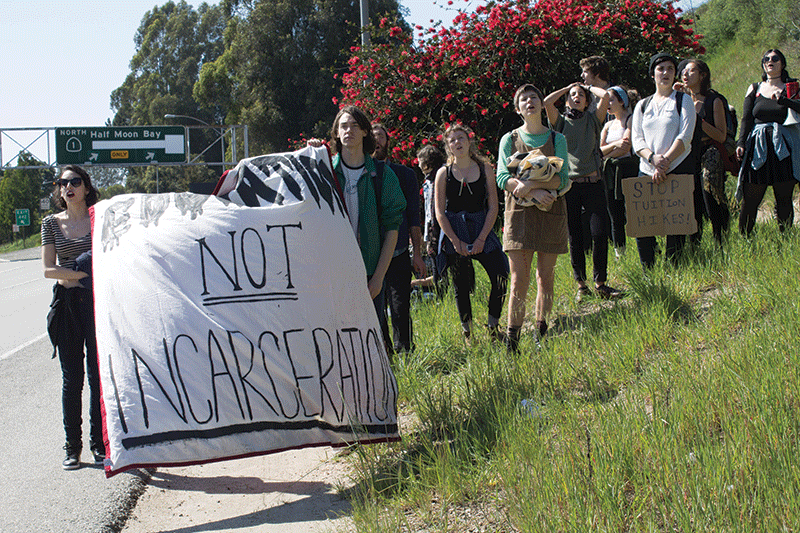 The students who were turned away from the highway returned to the entrance where they voted to walk to the Santa Cruz County Jail in anticipation of the protesters’ arrival. Around noon, the “disentanglement” team began to use a K12 circular saw, a jackhammer, a hammer and a 6-foot pry bar to cut the PVC pipe holding together the protesters and the cement-filled garbage cans. A California Highway Patrol helicopter landed to bring in officers and equipment. 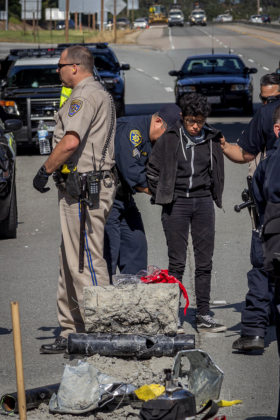 California Highway Patrol officer Sam Courtney said that officers tried to work with the students to voluntarily get them to move, but the protesters remained “stoic and non-responsive.” He said the police were “moving slowly and cautiously” to figure out the best way to move the students. 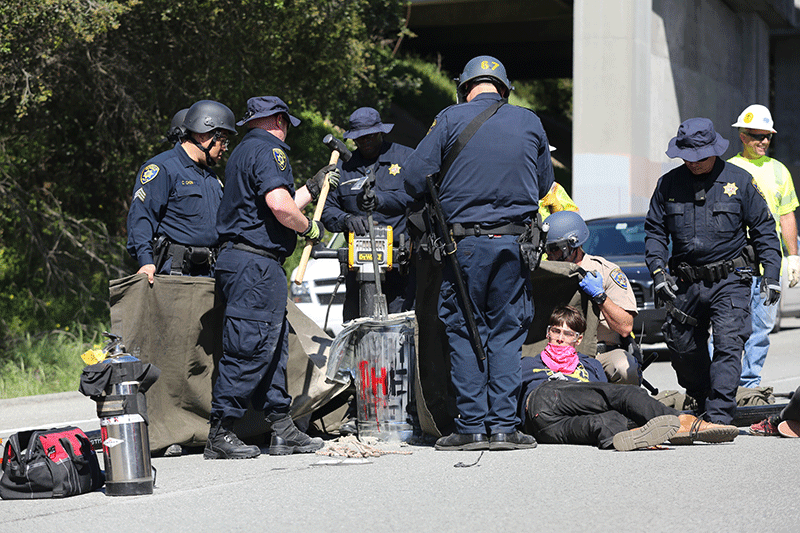 Over an hour later, the police sawed the first student out of the chain and arrested him immediately. By 2 p.m., all six student protesters were arrested and taken to the Santa Cruz County Jail. Protesters alternated blocking the northbound and southbound lanes of Water Street, holding banners that read “Fight the Hikes” and “Education Not Incarceration.” Protesters faced a barrage of honks as multiple drivers were visibly upset. Some interactions became hostile as drivers got out of their cars to confront the students. One altercation resulted in shoving between a student and a driver. Although UCSC administration is aware of the petition, UCSC News and Media Relations Director Scott Hernandez-Jason said the university’s disciplinary actions will be separate from the petitioner’s recommendations. “Obviously the criminal charges are the most serious that they can be facing, and parallel to that there could be a judicial affairs process, which is its own track and the punishments range from a letter of warning all the way up to expulsion,” Hernandez-Jason said. The “96 Hours of Action” also has a planned strike intended to shut down campus on Thursday. Katya Birken, who is currently on a leave of absence but will return to UCSC next quarter, voiced concern over the way students decided to demonstrate. She said the university should discipline the students arrested on a “case by case” basis, the extent of their punishment depending on their remorse and understanding of the disruption they caused. Bail for the arrested students is set at $5,000.